This tray will hold two Drop Pods. 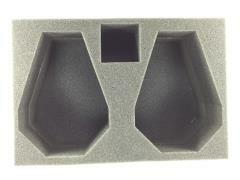 4.5 inch (114 mm) thick foam tray with 1x 2 x 2 inch (50 x 50 mm) cut out. Trays are designed to fit side by side in P.A.C.K. System Bags.